Slurping up Jinya and Tonkotsu. It makes me happy that, for many of us, the word "ramen" no longer automatically conjures visions of the noxious, salty, 10-for-a-buck packages of noodles pre-fried in palm- and cottonseed oil. You know, the instant "food" staple that so many college students purportedly survive on. With real ramen—high-quality fresh noodles bathed in slow-simmered, housemade broth with top-notch ingredients—garnering the culinary headlines of late, we're seeking big, hearty bowls of steaming, delicious restaurant ramen. Well, seek and ye shall find. Now, before all you ramen fiends start sharpening your swords, I should mention that I've sung the praises of this dish at Tosh's Ramen and Kobe Japanese Restaurant previously in these pages, as well as the short-lived noodle experiments at the now-shuttered Naked Fish and Plum Alley. Here I'm reporting on two newer hot spots: Jinya Ramen Bar and Tonkotsu Ramen Bar. Without going down too much of a rabbit hole, did you know that Japan has some 20 different regional styles of ramen? Indeed. All ramen is made up of four essential components: noodles, broth, toppings and tare, the salty essence (often shoyu) at the bottom of the bowls. However, regional styles in Japan range from Asahikawa (where melted lard is a topping) and the light, thin broth of Hakodate, to thick, hearty chicken-based kotteri-kei of Kyoto, and Nagoya's "Taiwan" ramen, which contains ground pork, Chinese chives, hot chile peppers and garlic. The non-supermarket type that Americans are most familiar with is probably tonkotsu, where the tare flavors are derived primarily from pork bones and their broth. It's the most common and popular style here, although many shops that serve it might also dish up shio-, miso-, and shoyu-based ramen. As you'd expect from a place called Tonkotsu, that style is the house specialty at this West Valley City restaurant. Before diving into the noodles, you might want to enjoy an appetizer or two. The "Yaki Trio" ($9.95)—three yakitori skewers of pork, chicken and beef marinated in a sweet, yakiniku barbecue sauce and grilled, was sold out the evening of our visit. So, we enjoyed pork gyoza ($4.95), which were perfectly acceptable pork-stuffed dumplings, along with not-so-pleasing takoyaki ($5.95). For this popular Japanese street food, bite-sized boiled octopus morsels are coated in a wheat flour-based batter and topped with Japanese mayo, takoyaki sauce, fish shavings (bonito), pickled ginger and scallion. While the flavor was great, the texture was not. The octopus was extremely tough and chewy, and most of our octopus balls went untouched. Along with ramen, Tonkotsu features a selection of rice bowls, including a not-so-Japanese poke tuna ($12.95) option. Raw, sashimi grade ahi tuna is marinated in a Hawaiian-style soy-based poke sauce and served sprinkled with sesame seeds and alongside rows of bright orange masago (capelin roe), seaweed salad, cucumber slices, marinated sushi ginger and avocado. All of that is served on a sparse bed of steamed white rice; we would have liked more to eat with the abundant poke portion. Ramen choices here include standard ones such as miso, shio, shoyu, vegetable miso, curry and the namesake tonkotsu. There are also less routine versions like tantanmen—a Chinese-inspired ramen with chile-black bean paste, spicy chicken broth, ground pork and bok choy ($10.95). Of the types we tasted, the tonkotsu ($9.95) was my favorite. The light, clean-tasting pork broth was spot-on, seasoned judiciously with shoyu and served with a large (almost as wide as the bowl) braised pork belly chashu, menma (fried bamboo shoot condiment), fried burdock root, nori, scallions, bean sprouts and marinated soft boiled egg (ajitsuke tamago). Underneath it all were the nicely cooked egg noodles. All in all, it was a very satisfying ramen experience. Since Jinya opened in Murray, it's been busy. With only seven counter seats and a total capacity of a few dozen, there's usually a wait, but the line tends to move quickly. Is it worth your time? You bet. With 27 locations in the U.S. and Canada, this franchise is one that doesn't feel or look like a restaurant chain. There is nothing cookie-cutter about Jinya, including the super-friendly servers. The son of a restaurateur in Japan, Tomonori Takahashi created the first location in Tokyo, before sensing a need for authentic noodles in the U.S. and opening a ramen bar in California. It was a quick success; even Pulitzer Prize-winning restaurant critic Jonathan Gold loved the place. So do I. The housemade gyoza ($6.95) is a fine place to start, but be certain to order a Jinya bun ($3.95). 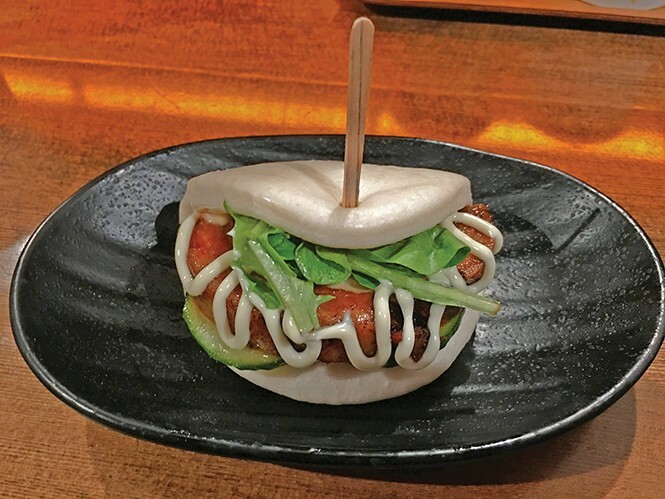 It's a scrumptious, shareable-size, doughy steamed bun brimming with stuffings like tender, slow-braised pork chashu, mixed baby greens and cucumber and drizzled with "kewpie" mayonnaise and their original bun sauce. An appetizer of crispy fried chicken thigh morsels with garlic pepper and ponzu sauce ($6.95) was fairly forgettable; next time, we'll order the crisp Brussels sprouts tempura. The ramen, however, is definitely memorable. There are a dozen different options, including two vegetarian ones, ranging in price from $9.95-$13. Portions are generous, and there are 25 add-on toppings that range from free garlic or butter, to pork or chicken chashu ($2). For $1 you can even get a noodle refill, but you won't need it. I could barely finish my regular portion. The pork and chicken broth for the Premium Tonkotsu White ramen ($11.95) is flawless; the noodles are made in-house and cooked to perfection, albeit a tiny bit thinner than I prefer. Half a boiled egg beckons with its golden-orange yolk, and large chunks of pork require skillful chopstick technique. For something a bit different, try the also-excellent spicy chicken ramen ($11.25) with braised chicken, spinach, spicy bean sprouts and a choice of mild, spicy or hot chicken broth.